Enoch Pratt Free Library, Central Library building, Cathedral Street main entrance. The Enoch Pratt Free Library is the free public library system of the City of Baltimore, Maryland. Its Central Library is located at 400 Cathedral Street and occupies the northeastern three-quarters of a city block bounded by West Franklin Street to the north, Cathedral Street to the east, West Mulberry Street to the south and Park Avenue to the west. Located on historic Cathedral Hill, north of the downtown business district, the library is also in the Mount Vernon-Belvedere-Mount Royal neighborhood and cultural/historic district. 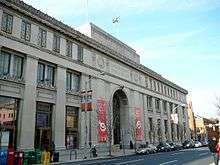 The Cathedral Street Main Library is the flagship of the entire Enoch Pratt Free Library system, now with twenty-two community and regional branches, it was designated the "Maryland State Library Resource Center" by the General Assembly of Maryland in 1971. Since August 11, 2016, the acting director of the library has been Gordon Krabbe, who has served as the library's chief operating officer since 1989. The merchant and financier Enoch Pratt, in a letter to the Baltimore City Council in January 21, 1882, offered to donate and construct a free public library with several neighborhood branches open to all the citizens of the City of Baltimore (and its surrounding environs). After some debate and discussion which was also widely reported in the local newspapers, the mayor and council accepted the gift and the terms of its conditions later that year, which were subsequently approved by the citizens in a referendum held during an election that October, 1882. Construction of a Central Library began later that year. The original Central Library building opened on January 5, 1886 . Part of Pratt's donation to the city, it was originally valued at approximately $250,000 and was accompanied by the gift of initially four other neighborhood branches in the quadrants of the city which also opened that year and were soon joined by two others, along with an endowment of $1,058,000 (in 1880's money). However, always a very thrifty man, Mr. Pratt provided that the bricks from the three 1820's-era townhouses that were to be demolished for his new city library were to be knocked off, cleaned and re-used in constructing a parish house and hall for his church, the First Independent Church of Baltimore, now the First Unitarian Church of Baltimore. By the late 1920s, Old Central could no longer hold the library's continually expanding collection, even though an annex had been added at the rear. Baltimore City voters approved a loan for $3,000,000 by an almost 3-to-1 margin on May 3, 1927. The Central Pratt Library's staff, services and 400,000 volumes were relocated to temporary quarters at the old Rouse-Hempstone Building at West Redwood Street and Hopkins Place (now the site of the Royal Farms Arena for a two-year stay during 1931-1933. At this temporary location, the Central Pratt was able to reorganize and plan for its future arrangements of departments and try out its soon-to-be famous "department store windows" displays Along with several townhouses facing Cathedral Street (including a significant one formerly owned by Robert Goodloe Harper) it was razed in 1931. The replacement structure occupies the entire block facing the "Old Baltimore Cathedral." Construction began on June 1931, during the darkest, most difficult days of the financial "Great Depression" and along with other major construction projects occurring at that time with the building of a new U.S. Courthouse and Post Office at Battle Monument Square at North Calvert and East Lexington-Fayette Streets, and the new Municipal Office Building on Holliday Street, across from the old Baltimore City Hall and the new Federal Courthouse/Post Office, offered an important source of desperately needed employment to the hundreds of out-of-work citizens of the city. The building was completed in January 1933, and opened to the public on February 3, with a record of not one day of suspended service since the original beginnings of "Enoch Pratt's Folly" on January 5, 1886. The Maryland Department Room, located on the second floor of the 2004 Annex, contains many of the library's prized collections. These include 275,000 mounted documents (mostly newspaper articles), 2100 maps, 6000 pieces of ephemera, and 24,000 photographs, all relevant to Maryland and Maryland history. The Maryland room also has a room full of books pertaining to Maryland, with an emphasis on Baltimore. Most materials in the Maryland Room are non-circulating but available for patrons to examine. Central Hall, Central Library building. In 2010, there were two million visits to Pratt, a 58% increase over the previous two years — more people than attended Ravens games. Pratt's award-winning website got 2,600,000 hits. 106,000 children, teens and their families participated in child and teen programs. Children and teens read 220,000 books in the Summer Reading Program. There are 600 computers available system-wide for public use. Pratt's branches serve the unique needs of patrons in their neighborhoods. For example, the Southeast Anchor Library has a program for new speakers of English and Spanish to practice their conversation skills informally. 1 2 3 4 5 6 History of the Library – Enoch Pratt Free Library. 1 2 Library Locations Interactive Map – Enoch Pratt Free Library. ↑ "About The Library". Retrieved August 23, 2016. ↑ "Enoch Pratt library names Gordon Krabbe acting CEO". August 11, 2016. Retrieved September 8, 2016. 1 2 However, later architectural historians come to a greater appreciation of the Victorian-era styles of architecture.Zajac, Mary K. "A cathedral of books," Style Magazine (Baltimore), September-October 2011. ↑ Gunts, Edward. "A new chapter is opening for the Pratt Library," The Baltimore Sun, Sunday, November 2, 2003. 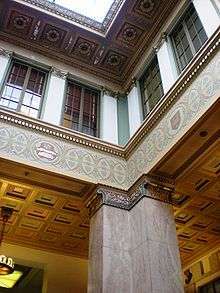 ↑ Information about the Central Library and its Central Hall – Enoch Pratt Free Library. ↑ Enoch Pratt Free Library. "Maryland Department: About the Collection". Retrieved 17 July 2012.